Google’s treasure house of geographic data, maps, and images is incredibly valuable and has driven a great deal of internet traffic to their site since they launched Google Maps in 2005. Google employs 7,000 employees to accumulate and update their map data including the streetview photo crews who drive or bicycle down streets around the world. Mapping applications are among the most important features of Smartphones and Apple couldn’t stand to have its archrival Google controlling the default mapping application on its phones. So, the new iPhone and iPad operating system iOS6 features the new iOS6 Maps application. Apple iOS6 Maps has amazing 3-D renderings of buildings, live traffic maps, attractive new cartography done by Apple’s own cartographers, plus amazing fly-over capability for some cities. Apple claims it loads faster because it uses a vector rather than raster file structure. Here is a great video explaining its features. But, reports of significant location errors are coming in from around the world. The StarTribune reports that the Guthrie is shown at its old location and the Minnesota Twins are shown playing at the Metrodome they left several seasons ago. Source: The Amazing iOS6 Maps Tumblr. 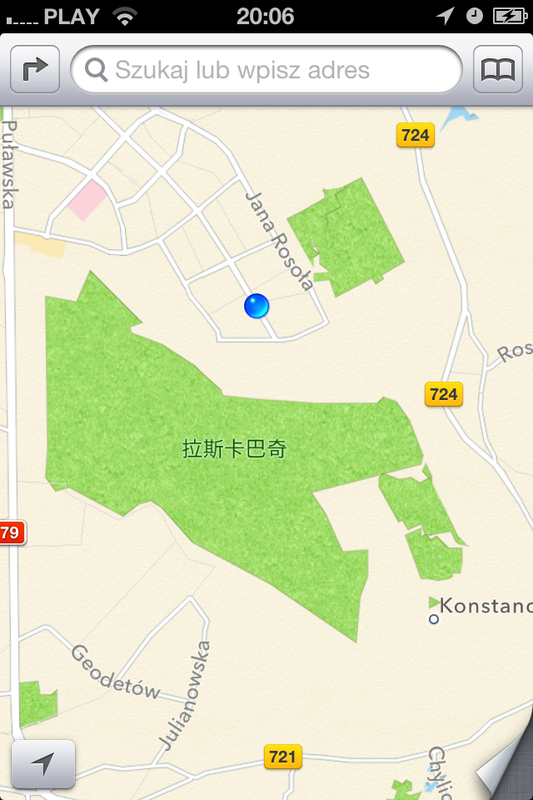 This map throws in random Chinese place names on a map of Poland.